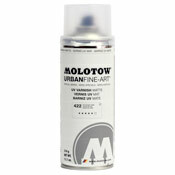 "Flame is the newest line of paint from Molotow. The sleek and modern can is equipt with a high performance valve system for producing smooth and precise lines. With good coverage and balanced pressure, flame will suit all of your outdoor painting needs. Affordably priced, Flame delivers the maxium value for you dollar. "